As a growing number of nations are enacting bans on captive dolphin shows, Pakistan appears to be moving in the opposite direction. For what is said to be the first time in the country's history, captive marine mammals will be forced to perform tricks for an audience. According to the Express Tribune, a dolphin, beluga and sea lion were recently imported to the Maritime Museum in Karachi, acquired from a marine animal vendor in Russia. They are being kept in tap-water pools treated with "different chemicals" to create marine-like conditions. 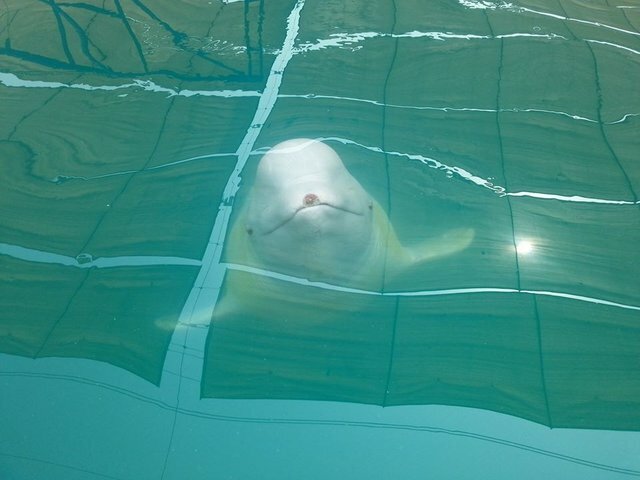 The beluga, which arrived by charter plane from Moscow, appears to have already suffered an injury to its muzzle, evidenced in a photo share on the facility's Facebook page. Each hour-long performances is said to include "the dolphin jumping high, the beluga singing its heart out and the sea lion giving a stellar performance." Organizer says that the aim of the shows will be to create awareness about the species' "human-friendly nature," adding that this is the first performance of this type in the region. The decision to host the shows has drawn criticism both in and outside of Pakistan, seen by many as a move counter to international trends away from keeping these animals in captivity. "There are sufficient opportunities for public to see wild dolphins off the shore of Pakistan, especially Karachi. They can be observed without too much effort or expense and the experience is much more rewarding," read a statement from the WWF. Biologist Mauvis Gore tells Pakistan's Dawn.com that the shows will spread disinformation about the state of the species in the wild. "Pakistan is being introduced to their key marine wildlife in a way that could take generations to re-educate," she says, "giving them the impression that these animals are there to perform for the public and at their whim."